The methods marketing agencies use to recruit influencers varies widely, and unsurprisingly directly impacts the results of campaigns. Whether your brand has been engaging influencers for years, or just starting out, you need to do your due diligence when it comes to researching influencer marketing agencies – it’s a matter of failure and success. When a business engages in influencer marketing they are confronted with many decisions, but we will argue here that the influencer recruitment process may be one of the most important pieces of information you should get before signing a contract. Here are a few questions you should be asking about the influencer recruitment process, and an explanation of how Acorn’s method yields qualitative results for our client’s campaigns. How Do You Build & Maintain Your Influencer Network? While some brands like to be hands on, others prefer to have the agency take care of everything, and neither is a wrong choice. However, all businesses should be as transparent as possible, so that the campaign runs exactly as they expect. Be detailed in your high level goals, who your customer is, and how you have run campaigns in the past. All of this information will be helpful for the agency who puts together a plan. At Acorn we have a large, open network of influencers we have curated over the years, and we are always eagerly adding more. (Are you an influencer? Sign up here!) Our influencers come from all walks of life, are trend-setters in their niche, have an actively engaged audience, currently based in the United States, and are vetted before joining. 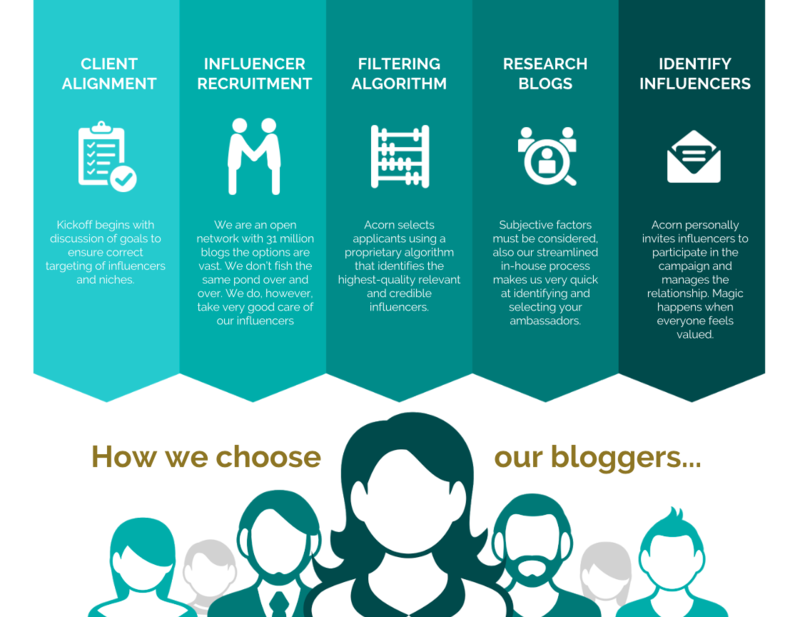 Acorn selects influencer applicants using a propriety algorithm that identifies the highest-quality, relevant, and credible influencers. Acorn’s ability to active influencers in the right space gives more opportunities to impact the lives of their readers, and deliver greater returns to the brands. Does the influencer have an affinity with a specific retailer, or brand? What kind of organic content are they publishing on their blog? Who is their audience? Do they fit the target audience the brand wants? Which social networks do the influencers perform best on? How do they tie their blog content to social? What type of content do they publish regularly? Photos, videos? How’s the quality of the visuals? Our unique influencer outreach strategy is to hand-select influencers for a campaign, rather than have them bid on it. Only people we pitch to will know about our campaigns, then they respond with an application before our team selects them. That way we maintain confidence in the performance of our vetted influencers. This is very unique, but the most effective method we’ve seen to date. How is it different? Most influencer marketing agencies allow the fastest influencers to apply to a campaign when it is open. This doesn’t allow for quality control checking. While all influencers have an audience, and are vetted by our team, picking the RIGHT influencer for the RIGHT campaign is essential to driving results. Our campaigns by invitation-only so that anyone who accepts the invite is an influencer we know can drive the results your brand needs.